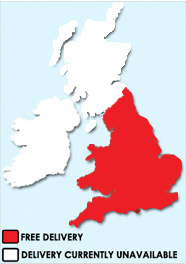 FREE Delivery to all areas of mainland England and Wales. We try to keep most of the products on the website in stock and available for express delivery (1-5 working days). Once we have received your order we'll call you (within 24 hours) to confirm a suitable delivery slot so please try to include a contact phone number with your order. If you have a preferred delivery date please add this to "Customer Notes" on the order form and we'll do our best to achieve it. We deliver: Monday - Friday 7am - 6pm. Please note that our standard delivery service is to the first door of the property. If you require any further assistance please specify this in the "Customer Notes" section of the order form so that we can make suitable arrangements. Failed delivery attempts are charged at £35. At The Bed Warehouse we use our huge buying power to ensure that you get the very best deal available on line or on the high street. We monitor our competitors prices daily but should you find a better deal (including delivery, VAT etc.) on the same product (or combination of products) please let us know and we’ll do our very best to beat it. Call Free on 0800 049 0800. All products from The Bed Warehouse carry a minimum 12 month manufacturer warranty. Information on the terms and conditions of individual warranties will usually be within the packaging of your new product. In the event of needing a repair/service/exchange within a warranty period please contact us at customerservice@thebedwarehousedirect.com with details of the problem and your purchase order number. Please note that all mattress warranties expect the mattress to be kept in a clean, hygienic and sanitary fashion to this end we strongly recommend the use of a mattress protector. We realise that you might be wary of making credit or debit card transactions online, so we want to assure you that we take security very seriously. We use the market-leading Sage Pay payment gateway together with the industry-standard SSL security protocol to encrypt all information. Our SSL certificate is issued and authenticated by Thawte, enabling our end-users to be confident that our identity is guaranteed and that all transactions are protected by the highest level of trust and security. Confidential information, such as card details, is protected from interception and hacking and is never stored on our servers.